This post created in sponsorship with Leesa. Mattresses are a sensitive subject around our house. My husband and I have slept on the same mattress for I don’t know how long. (I mean, not only have we slept on THE SAME mattress as each other cause we are married and all, hahah, but on the SAME MATTRESS we’ve had forever.) Seriously, we’ve had this same mattress in three houses so there’s a clue to the embarrassing truth of how old it is. I really want a new mattress so it has been a topic of discussion for years, but my husband is unwilling to take the plunge to try to find a new one we like. Because, you know, RISKS. MONEY. TIME. Too many decisions and too many worries to think about when buying such a significant item for our home, so we just avoid talking about it. I want a mattress that feels luxurious, is super comfortable, and affordable. Does that mattress even exist? Too much to ask? We are dreading moving the one we have to our future new home because the mattress is such a beast that we risk injury to ourselves when we make the bed. Imagine the two of us trying to haul that mattress down the stairs? DEATH BY MATTRESS. Or, by the cost to move it. And, really, who wants to risk buying a new mattress and regretting it for the next decade? Since we don’t really need a new mattress until we have a new house anyway :) (ah, the logistics of moving!) I suggested Kylee order one for her guest room! WOO HOO! You have seen snippets of her townhouse, it’s a cute little three story attached townhouse tucked into the beautiful Magnolia neighborhood of Seattle. But, getting furniture up to the second and third floor is comical. Remember her sofa tale? So imagine her joy to see this mattress would arrive in a little box that she could carry upstairs with ease! :) I’ll let her tell you the story. Hi friends! Kylee here. 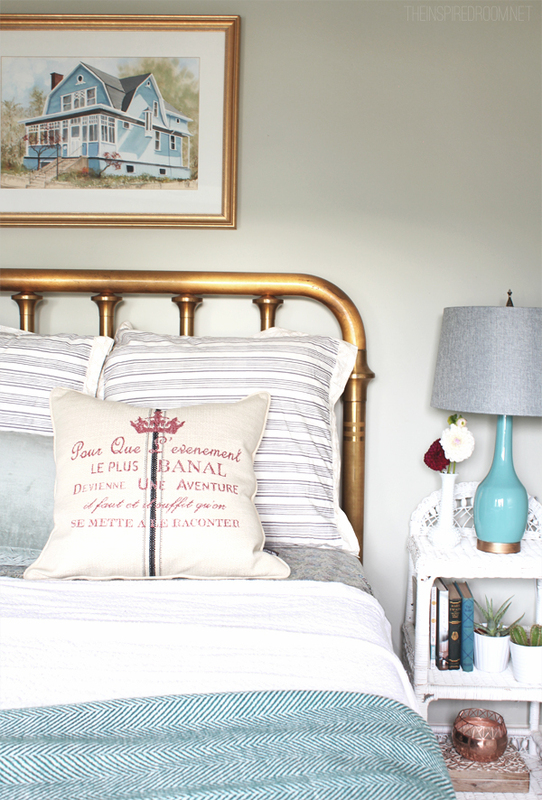 I’ve been dreaming about how to make our guest room a cozy spot for when guests (and my parents) stay the night. My husband Lance and I are just starting to think about things like bedding and the necessities guests might need, but the mattress we had was so saggy we knew needed to get a new one before we did anything decorative to the room. When my mom told me about the one she heard about from Leesa, it sounded perfect for our needs. Now, I had never bought a mattress before (we’ve always had hand-me-downs) but I can say that order this was the EASIEST experience ever. Clearly the way of the future, it came BY MAIL in a box the size of a mini fridge! I could hardly believe an actual mattress was in the box, but low and behold it was! My sister Courtney and I were able to get it in the house all by ourselves. I buy most things online these days, so I was thrilled to order this one online and not talk to a sales person. Plus, it seemed like a no brainer to try it, Leesa gives you 100 nights to try your new mattress, risk free! If we didn’t like it, we could send it back. When it arrived, Courtney and I brought it up to the little guest room on our third floor, still perplexed as to how it was going to turn into a real, functioning mattress. We unpacked it and watched in awe as it expanded to its full size on my inherited brass bed. This is such a small room we can barely maneuver around to take photos, so we were pleased that setting up this mattress wasn’t difficult for us to manage in such a small space. The 10” mattress comes in all sizes, and is crafted with 3 unique foam layers, including 2” of memory foam and 2” of a really cool latex-like foam called Avena™ that’s perforated to keep you cool as the other side of the pillow. One of my favorite things is that for every 10 mattresses sold, one is donated to a shelter! We’ve already spent time trying out the mattress in the guest room while watching TV and movies in the evenings, and so far we find it to be really comfortable! No more saggy mattress and I’m really happy that our guests can enjoy their stay. 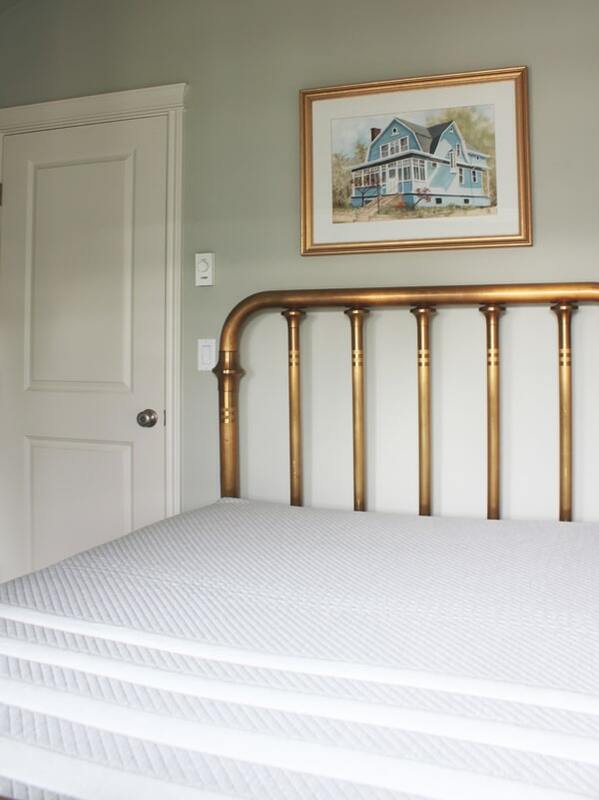 We feel like real grownups now to have an actual guest room with a brand new mattress! And I know my mom is excited to let my dad try it out to ease his fears about buying a new one. I think he will be pleased! And, here is good news! 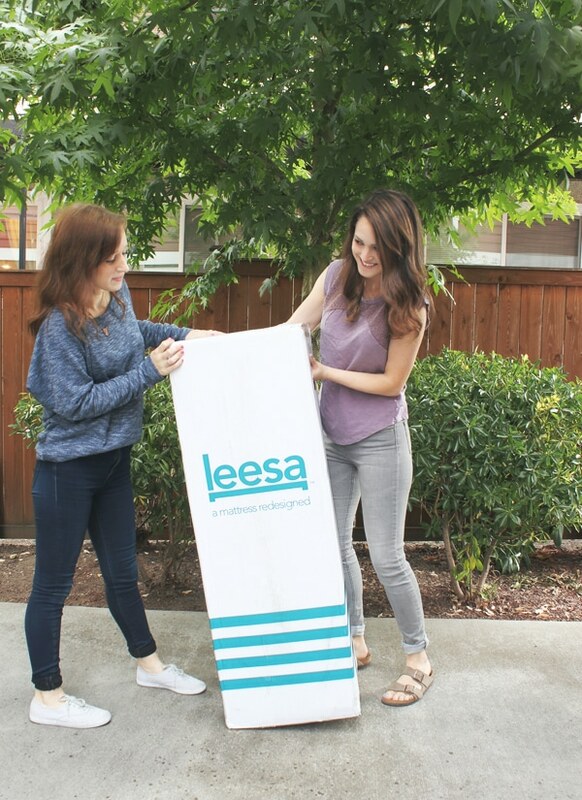 If you want to try a Leesa mattress, the first 15 readers who click here to redeem promo code INSPIREDROOM at checkout will get $75 off their order! This post is sponsored by Leesa. How interesting… so when you move it can you manage to somehow fold it back into the box? It looks really nice. I hope you do a followup in 100 days, so we can see how it lasted! It’s a neat idea. Hi, great room. I am curious about the bamboo shade. It looks great and I’m wondering how you mounted it to the wall? I don’t know about her shade, but we have some just like that- they literally only have two hooks at the top of the shade. Two little screws in the wall and the hooks rest on the screws. Hers look just like mine. Wish I saw this a month ago! Living in a rental for six months…building new home…our master bed was sent to storage. Bought a new bed and mattress to use in apartment and will then be one of our guest beds once home is completed…it has been a nightmare with getting a mattress! Found one we loved….purchased it….delivered…rock hard! They called it defective…delivered another…WRONG mattress, completely different than what we purchased…then they delivered another one…correct mattress, soft and exactly the comfort level we purchased BUT there is a lump in it! Whew is quality control?! ?…so a month later we are waiting for them to come out to inspect so a new one can be delivered. UGH. If this doesn’t work out will be checking out LEESA mattress’ ! Thanks for your post. UGH! That’s annoying. Such a hassle. I hope you get it resolved or are able to try out this mattress from Leesa! Did you put the mattress on your old box spring or buy a new one? I’m not in the market for a new mattress, but it was fun to see your daughters in this post! 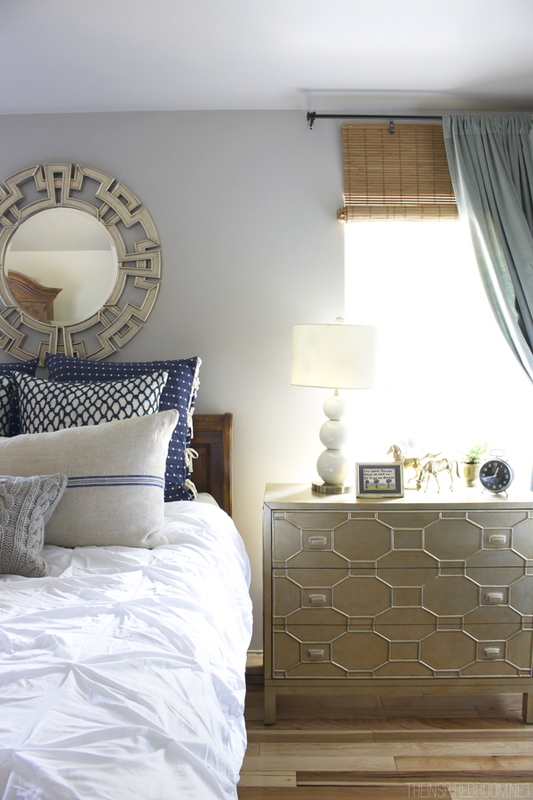 Love the lamp – where is it from? Thanks! Your post came at perfect timing for me! My husband and I are celebrating our 25th anniversary this year and it’s been on my summer bucket list to shop for a new mattress yet I’ve been dreeaaddding it!! I just ordered a Leesa mattress (with the discount!) and I’m so thankful that I don’t have to go to the stores to figure out which is best for our backs. Please email me! I absolutely ADORE your book and have talked about it on my relatively new blog. I would like to ask you a few questions privately. Thanks. And… congratulations. You deserve it!!! Thank you Michelle! You can email me at theinspiredroom@gmail.com Thanks for your kind words :). 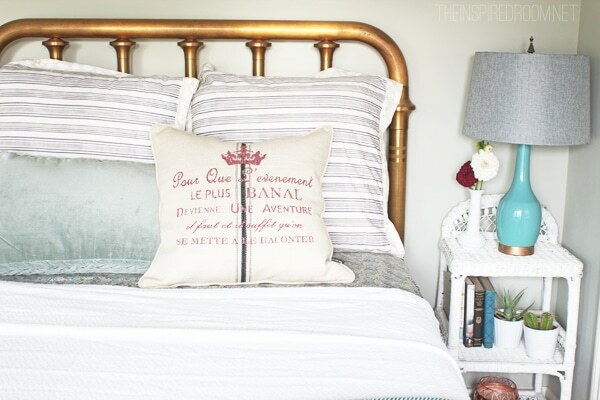 Can you please tell me where I can get the pillow ‘pour que l’événement le plus banal…’? The pillow is white and the writing is red. My husband and I just bought a mattress online as well! We purchased the Tuft & Needle mattress and absolutely LOVE it! It is supportive and firm but oh so comfortable because it is foam. It is also really affordable and has great reviews on amazon (we ordered from the tuft & needle site though). It came to the house in a box as well and was heavy but my hubs and I could (barley) handle lugging it up the stairs. Good luck!